Wine expert Gina Gallo shares her favorite sangria cocktail, plus her grandma's turkey crepe recipe. As a toddler Gina strolled the vineyards alongside her grandfather Julio. By age 10, tending grapes was second nature. High school summers happily spent working in the winery led to courses in winemaking, then an apprenticeship at the family&apos;s experimental micro-winery in Modesto, California. Today this passionate mother of twin girls is the brains behind limited-batch artisanal wines in the Gallo Signature Series. During the two-month harvest she almost never strays far from the action. "It&apos;s like any profession when you&apos;re constantly on call," Gina says. "You never know what can change." Of course, relaxing with a glass of wine always helps. Try one of her favorite chill-out recipes. 1. In a large pitcher combine wine, brandy, lemon zest and sugar. Stir until sugar dissolves. Add remaining ingredients, except seltzer and ice cubes, and mix well. 2. Place pitcher in the refrigerator for 1 to 4 hours to allow flavors to meld. 3. 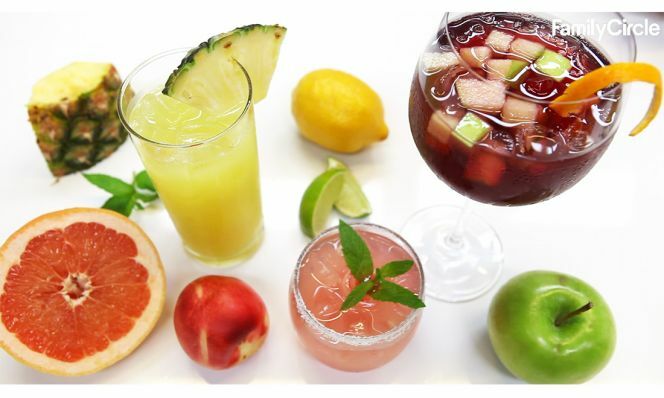 Just before serving, add ice cubes and stir briskly to distribute fruit, then top off with seltzer. Combining apple and pear with sweet, fruity Moscato makes this refreshing twist on the classic red wine sangria an appealing pick for casual fall gatherings. This recipe is one Grandma Gallo used to make with chicken, but it's a wonderful way to use up leftover turkey around the holidays. Have crepes ready. Melt butter in saucepan over low heat. Stir in flour. Cook, stirring for 1 minute. Gradually add stock. Bring to boil. Cook, stirring over low heat 1-2 minutes or until mixture thickens. Remove from heat. Add turkey, salt, pepper, parsley and chives. Remove from heat. Beat egg yolks and light cream in a mixing bowl. Add a little of the hot sauce and mix well. Turn egg mixture into remaining hot sauce in pan. Stir together. Put a portion of the mixture on the center of each crepe. Roll up crepes. Place crepes in a buttered over-to-table baking dish. Sprinkle with cheese. Preheat oven to 375 degrees. Bake 10-15 minutes. Serve at once. Serves 6. According to Gina, "A traditional Thanksgiving meal in my family wouldn't seem complete without a bottle of Pinot Noir. This one's a particular favorite. The flavors of cassis and blackberry perfectly complement turkey and the dishes that go with it."